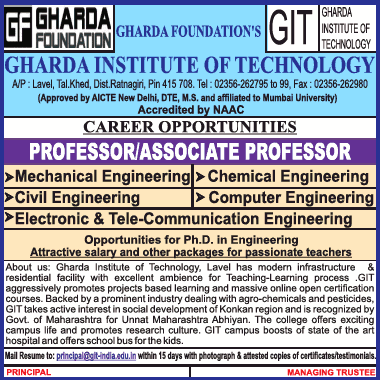 Gharda Institute of Technology, Ratnagiri has advertised in TIMES OF INDIA newspaper for the recruitment of Professor/Associate Professor job vacancies. Interested and eligible job aspirants are requested to apply with in 15 days. Check out further more details below. About College: The principle objective of the Gharda Foundation is "To carry on activities for the benefits and development of residents of rural India by application of all suitable means available with focus on issues like health, literacy, non formal education, social awareness, agriculture, technical education etc. on its own or by joining hands or by helping like minded NGO's ". Establishment of Gharda Institute of Technology in a typical rural sector is also a step in line with the philosophy of Gharda Foundation.